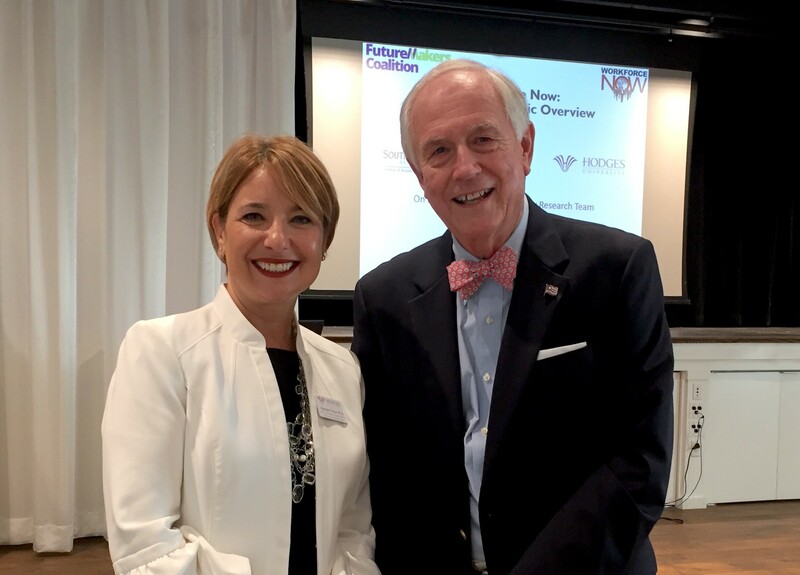 Dr. Aysegul Timur, Hodges University with Al Hanser, Founder and Chairman of The Sanibel Captiva Trust Company at the firm’s Welcome Back event. The Sanibel Captiva Trust Company held their “Welcome Back” program this week featuring Hodges University Professor, Dr. Aysegul Timur, Senior Vice President of Academic Affairs and Dean of the Johnson School of Business, who spoke on the changing characteristics of Southwest Florida. Ninety guests attended the event at the Sanibel Community House to reconnect with friends at the evening reception and hear Dr. Timur’s presentation regarding the changing demographics, resources and needs throughout our five county area. The eye-opening study is a product of “Workforce Now” a regional research initiative inspired by Education Summits produced by The News-Press in 2011 and 2012. This has become a collaborative economic effort between Hodges University, FGCU and Florida SouthWestern State College. Lee County is thriving, and population estimates are projected to increase from 774,458 people in 2020 to 1,077,763 in just 20 years by 2040. Population increases will continue to speed up with a projected number of 1,243,696 by 2050. This leads researchers and community leaders to consider how to prepare to meet the needs of this population across education, employment, human services and more. A shift in ethnicity is projected as well. From this year through 2050, the culture of the population will transition from 79% non-Hispanic and 21% Hispanic to 60% non-Hispanic and 40% Hispanic. Number shifts are similar in Collier County. Additional topics discussed included the gap between work wages and housing for many working families; education, and addressing how the STEM program aligns the types of degrees or certificates from our educational system with available local employment opportunities. Southwest Florida’s “Fastest Growing Industries by Employment” are currently construction, accommodation and food services, retail trade, healthcare and social assistance, and administrative and waste services. Yet, there are also an abundance of STEM positions that need filling in Southwest Florida: healthcare practitioners and technical; computer and mathematical; architecture and engineering; business and financial operations, management and others. The conversation will most certainly continue. To learn more about Workforce Now’s Regional Economic Overview, and obtain a copy of the slides from this presentation, email atimur@hodges.edu.